This would make the perfect dessert to have on hand throughout the week for a little something sweet after meals or to take along as a dessert to dinner parties. It’s delicious on its own, but it’s elevated with fresh berries and citrus zest. 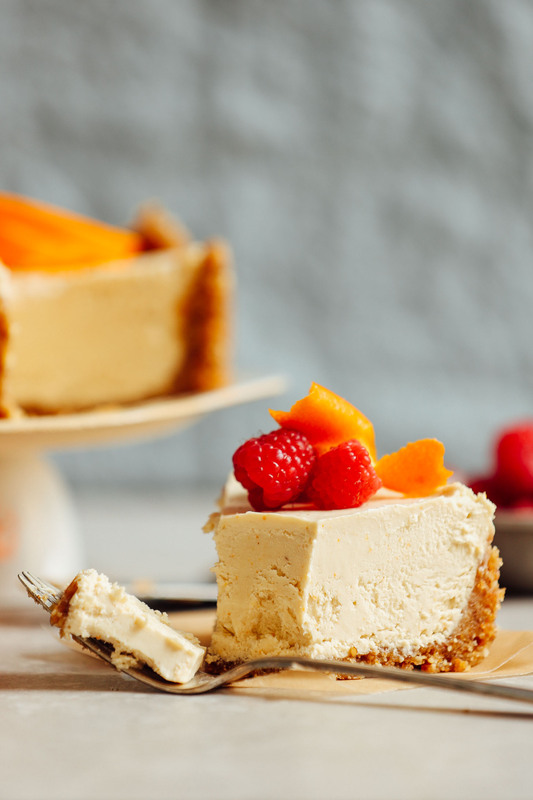 If you’re into cheesecake, also be sure to check out our No-Bake Vegan Chocolate Cheesecake, White Chocolate Macadamia Nut Cheesecake, Easy Baked Vegan Cheesecake, 7-Ingredient (Mini) Vegan Cheesecakes, and Matcha-Swirled Vegan Cheesecake. 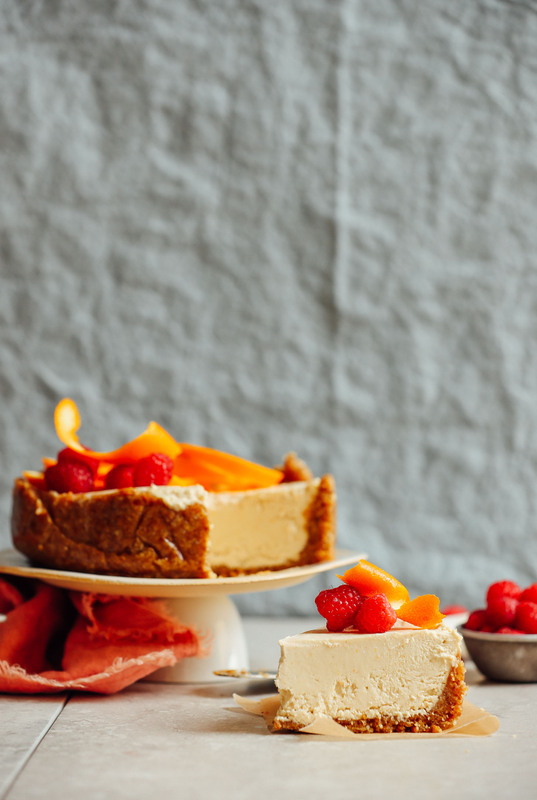 Creamy, decadent vegan cheesecake made with a date-walnut crust and cashew-coconut-yogurt filling for the ultimate tangy-sweet treat. Just 10 ingredients required, no bake, and entirely vegan and gluten-free. 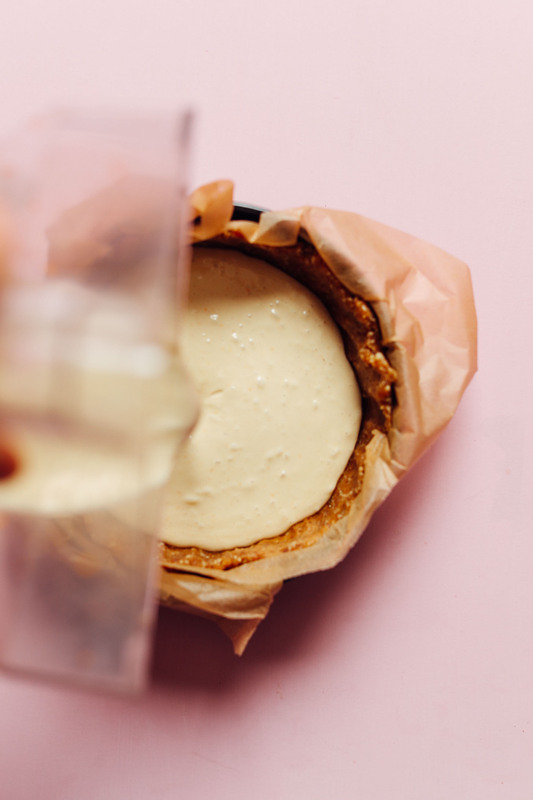 Prepare a cheesecake pan (I prefer this springform one, but round cake pans or loaf pans work as well) by lining with parchment paper. Set aside. To the food processor, add walnuts and salt and process into a meal. Then add dates back in and blend until a loose dough forms - it should stick together when you squeeze a bit between your fingers. If it's too dry, add a few more dates through the spout while processing. Add crust to pan and press with fingers to distribute. To pack it down, use a small glass wrapped in parchment paper and really press it down, allowing the crust to come up the sides. Set in freezer to firm up. Add filling to the chilled crust and tap a few times to release any air bubbles. Then loosely cover with plastic wrap or wax paper and freeze until firm - about 6 hours or overnight. Before slicing and serving, let thaw slightly for about 20-30 minutes. Serve as is or top with a touch of coconut whipped cream and/or citrus zest and fresh berries. *Nutrition information is a rough estimate calculated with the oil and without additional toppings. Would it be possible to make the crust the night before? That would work! We recommend storing it in the freezer. Hi Jennifer, we don’t think this recipe would work well without the maple syrup as the texture and taste would be much different. Hope that helps! this was absolutely delicious- my first vegan cheesecake, and it was as good if not yummier than traditional cheesecake. took it for a dinner party, where only one person was vegan, and it was gobbled up before all the non vegan desserts! i did sub in your almond oatmeal crust, and sugar instead of maple syrup. i also added w but more lemon and a drop of lemon essence to make it more lemony. loved it! Hello, I would like to try this recipe this weekend. It looks yummy! Could I add some previously defrosted berries to the mix when I blend the cashews? And maybe a couple of dates to add some sweetness? I would think that could work, though we haven’t tried ourselves! Let us know if you experiment with the recipe! I was wondering if the coconut yogurt you used was unsweetened or sweetened? Thank you! Unsweetened, but we make our own! Just wondering if leaving this out of the fridge/freezer for too long will make it runny? Like 1-2 hours? Its best served cold and will soften after a couple hours! I made this last night and it was really tasty! The filling is really good and holds it’s shape really well. I would say get it out of the freezer at least 30 mins before serving as you don’t want it too cold. I swapped out the raw base in the recipe for a biscuit and melted vegan butter version just because that seemed easier. Can I sub dried figs for dates in the crust? Hi Sandy! I can’t say for sure as we haven’t tried it ourselves, but let us know if you test it out! Good luck! I want to use vegan eggnog in the filling. Is there any chance I could sneak in this liquid without losing the texture? Hmm its worth a shot, but we can’t guarantee successful results, Melina! Let us know how it turns out! I made this recipe with “so delicious coconut milk, yogurt alternative” and I used slightly less maple syrup to make it tarter. And WOAW was it delicious. My non vegan family loved it. Thank you so much for the recipe! My PROBLEM with This (Raw, Uncooked) cheesecake recipe and WITH ALL RAW CHEESECAKE RECIPES is that i Don’t have ROOM TO STORE an 8 or 9 inch Springform Pan in my Freezer!! I am Vegan and work hard to eat RAW VEGAN BUT this Need for FREEZER SPACE is making me CRAZY!! Springfirm pans take up lots if space & it must be stable & on Top!! Does Everyone have HUGE FREEZERS? I Don’t- Mine is packed with necessary items, like fruits for smoothies & bowls, tofu, tempeh & seitan, waffles , frozen dishes, NOT to mention so Many necessary Other STAPLES that are VITAL to a vegan chef! BIG PROBLEM US These refridgerated cheesecakes FALL APART UNLESS they are FROZEN!!! Help!! Please! The last couple of times I’ve made this, the consistency is a little frozen/icy if that makes sense? The first time I made it, it came out perfectly and was super creamy! What could I be doing wrong to get that weird icy consistency? What could be a substitute for the walnuts? Pecans should work if you can have them! Amazingly creamy, that’s a real success! Thanks for the recipe! I’ve had not enough lemon so I added a bit of apple cider vinegar to keep the acidity and firm up everything, turned out great! But I won’t advise putting 100% vinegar instead of the lemon juice. My springform pan is 8 1/2 or 9 inches. Would you suggest increasing the recipe by 1 1/2 times or doubling it? I want to make it for a special brunch next week and there will be 10 -12 people present. made this cake for my vegan friend for her birthday and she loved and i loved it myself. filling is amazing. my springform was too big so the base came too thin and had to make extra filling but oh my it was delicious. Yay! We are so glad to hear that, Kerli! I’m guessing you meant CocoYo since I didn’t see any coyo? Coyo is our preferred brand of coconut yogurt! Darn I guess we don’t have it out here thanks! Will still give it a try tonight! For all the people with nut allergies: I have made this with cashews and then again subing the cashews for sunflower seeds. It is better with the cashews, slightly creamier and more “nutural” in the flavor compared to using sunflower seeds. BUT, it is great anyway, unless you really hate sunflower seeds, becuse you can taste them a little when it is finished. I would perhapes use full sweetner if useing sunfloer seeds, I did not and I think it would be a little bit better still then. Hi ! 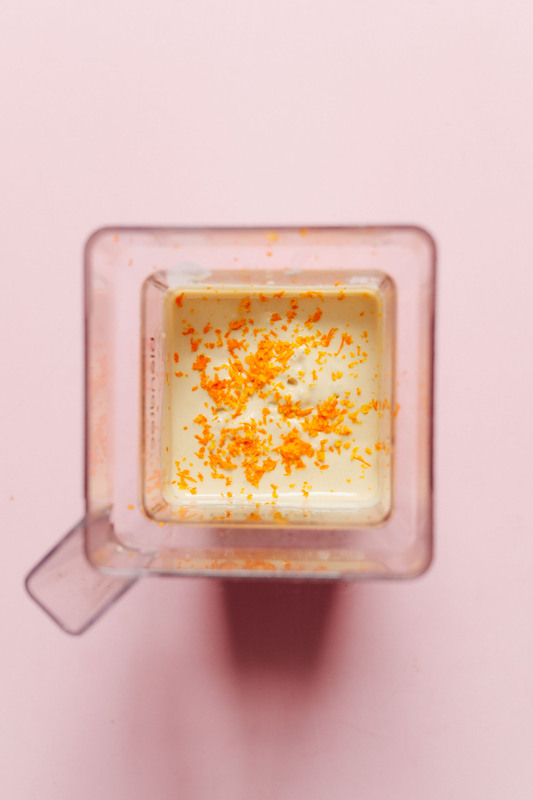 Sorry to bother but can you please also use grams for measuring, since it is very difficult for me to understand clearly how much should I use, since it’s not easy to google search everything from cups- gr…. Hi Emily! You’ll notice that you are actually able to change between metric and US customary + can find those options just above the ingredient list! Hope this helps. The bomb. Such a beautiful, tart filling – and I love the tang and freshness of the coconut yoghurt. I made it to the recipe (using orange zest), just reducing the maple syrup to 1/3 cup. This was amazing, so so tasty! What a brilliant recipe, thanks so much! So delicious and super easy to make! Whipped this up to feed a mixed crowd, and as my FIL said it’s carnivore approved! Can I omit maple syrup? Use dates in the filling instead? I think that could work! Report back if you give it a try! Hi Dana, can I replace the walnuts with pecans? I’m not a huge fan of rolled oats. Thanks! WOW, my husband and I are SO impressed with this ridiculously delicious cheesecake. My husband is nowhere close to being vegan or vegetarian, but even he was extremely impressed and agreed it’s one of the most delicious cakes he’s ever had. I love that there is a lot of complexity in the flavor and it doesn’t leave you feeling weighed down. It actually tastes very similar to what you find in a Larabar–my favorite brand of fruit/energy bars. I should add that I roughly doubled the amount of lemon juice in the filling and added 2 extra tablespoons of the coconut yogurt because I wanted it to be extra zingy. I made the coconut yogurt using the recipe from this website–it turned out super liquidy, but I would say that’s because of the brand of coconut milk I used. This is the first dessert recipe I’ve tried from this website and will definitely be trying others. YUMMM!! This is the most cheesecake-like vegan alternative that I’ve yet come across. 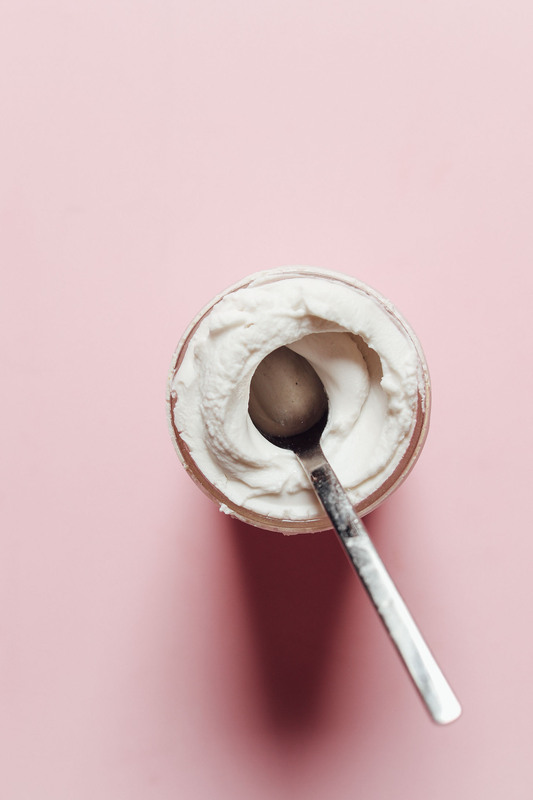 We used the COYO, and we are in love with this yogurt. We’ve yet to come across a vegan yogurt that actually tastes good. Thank you for the recommendation! Even my 6 yo said a plain yogurt was “delicious”! Made this for my birthday on Sunday. It was delicious, easy and perfect. Couldn’t have had a better birthday treat. Thanks Dana! Hey I can’t wait to try this recipe but wondering if I can substitute the dates with something that has less carbs (keto) I was gonna swap the maple with stevia ? What you think wonderful lady ? Hmm I’d recommend keeping the dates in this crust, but if you try something different, report back on how it goes! As for stevia, that should work, thought we haven’t given it a try! Good luck! In the same boat and I’m using a different crust. This was absolutely delicious and enjoyed by the whole family. Will definitely be making it again. Just wondering if it would be possible to bake the crust before adding the filling to make it crispier? Hi Belinda! We’re glad you enjoyed it! We haven’t tried it, but I think that should work! I’d recommend using this recipe for reference. Let us know how it goes! Hey, I made some cultured cashew creme cheese the other day. Do you think I could use some of that in place for the cashews? I think that could work, though we haven’t tried it and can’t say for sure. Let us know how it goes, Erica! I soaked almonds not walnuts for the base -should I dehydrate them before using these? Hi Naida! I am not sure how well dehydrating them would work, but if you give it a try, report back on how it goes! I would recommend using the soaked almonds for another recipe like our DIY almond milk, and then using raw almonds for the crust. Hope this helps! Yay! We’re so glad you enjoyed it, Ally! We made this as our Easter dessert. Everyone raved about it! I used orange zest and juice, which was delicious. Thank you for such an indulgent tasting, yet healthy dessert! This cheese cake is so tempting… Yummm..
Can I replace coconut oil with olive oil here?? We haven’t tried olive oil in this recipe but you can always just omit the coconut oil here! I love your blog! I would like to try this recipe but I do not have a freezer. Will it also firm up in the fridge? Keep up the good work! Thanks. Hi Fiona! I’m not sure the fridge would do it unfortunately and would recommend a freezer for this recipe! Can I make this two weeks ahead and leave it in the freezer until serving? This cheesecake was sooo good! I used oats to make the crust and left the coconut oil out. Using a 21 cm round bakingpan, I had a kind of thick crust so next time I will try to use two thirds of the given amount of crust ingredients. I sliced the cake the following morning (directly from the freezer with a sharp knife) and put all the slices (except for one, lol )separately packed back in the freezer. So now I have always a treat availlable. Can’t wait to try another one of your recipes. I was unable to find a few items as an expat working abroad, so I made it with local village yogurt instead of cocount yogurt and with honey instead of maple syrup. It is so easy & taste just like a New York cheesecake, amazing and satisfies any sweet craving. Loved it!! Yay! We’re glad to hear it, Barbie! Made this for Easter and the results were outstanding, even the non-vegan cheese cake eaters enjoyed it! Yay! We’re glad to hear it, Brian! Yum, cheesecake is glorious! I always have wanted to make my own coconut yogurt as well. I might have to try creating your coconut yogurt first and then using it in this recipe! So delicious! It’s worth making your own coconut yogurt! I just made it for the first time this week. My 14 year old and I have a dairy sensitivity and really miss yogurt. Don’t like the ones in the store due to all the added sugar, etc…. We both LOVE the homemade coconut yogurt! Just went to Whole Foods this morning to buy more coconut milk. It’s so worth it!!! I have made this cheesecake and it was delicious! Thank you. Thank you for this amazing, creamy recipe! I didn’t have coconut yogurt so I used almond yogurt instead. I skipped the coconut oil and only added half the maple syrup for a lighter version. AMAZING!!! I used prepared cashew butter which guaranteed a creaminess. It was delicious end to our Easter! How much cashew butter did you use? I have read you use half the amount of but I want to know from someone who has made it with success. This is sooooo good! Made it for Easter and it was beautiful. I added a little nutritional yeast and a dab of coconut vinegar to the filling because i wanted it to feel like a super tangy new york cheesecake and it did the trick! Thank you for this amazing recipe! I made this yesterday and it came out great. Can’t wait to share it with fam and friends! Hi, Dana! Did you use the mentioned portions? Just tried it out for Easter! It was delicious, although in need of about 2-3 times the filling :) keep up with the awesome work you are doing here! Yes, I did make the recipe as instructed. My crust was pretty thick, so perhaps you thinned yours out over a large pan and then needed more filling? In any case, perhaps next time double the filling as needed. Good luck! Is this refined sugar free? I had no syrup, so I made it with 80 gr cane sugar instead. Maybe less healthy, but by no means less enjoyable! First, this recipe looks absolutely fabulous! Second, have you found a good substitute for cashews? Hi can i churn it in an ice cream maker to make it scoopable? Thanks! I think that would be totally possible! Let us know how it goes. This looks so delicious, I definitely want to try this out! Would it be possible to use soy yogurt instead of coconut yogurt? This is a beautiful dessert! Can’t wait to make it. So happy to see that the oil can be omitted, I’m trying very hard to be oil free! 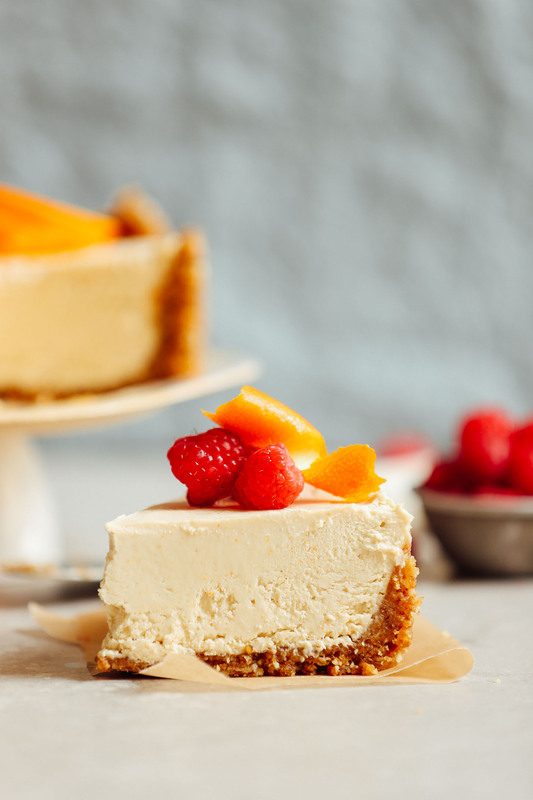 Loved the coconut yogurt recipe and it will be fun to incorporate it into this cheesecake. Thanks! I’m curious if you could use coconut milk kefir instead of the yogurt? I make it at home. Hmm, not sure! Wouldn’t it be too thin? If you try it, let us know! Good point. Maybe I’ll just use less than the recipe calls for and we’ll see what’s happens! Thanks ? Sweet Baby Jesus, I just made this and the filling is delicious!! This trumps a normal cheesecake any day. Now to wait until lunch tomorrow with the family to have a slice! *sigh* You are amazing, Dana! Macadamias are a good substitute for cashews. Dim you think that the texture will be the same? ? It won’t be as creamy, but the flavor is nice! I think it would just be tarter, but I imagine if you use salt or orange zest, it would have a nice taste still. Looks amazing! What could you substitute the cashews for? 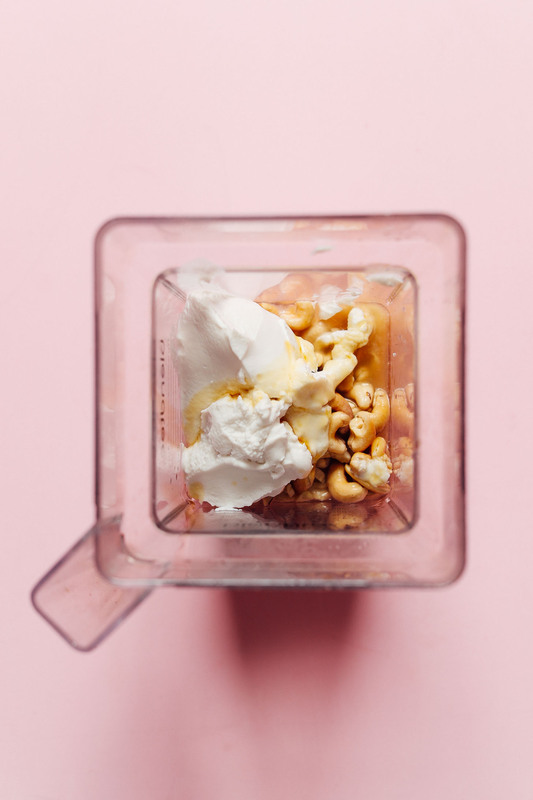 I have recently found I have a cashew and almond allergy along with my egg allergy, so I am having great difficulty finding sweet treats these days. Someone suggested tofu but unfortunately I dislike tofu. Maybe some kind of seed? Like sunflower. Or tofu should work too, I’m trying to reduce my soy consumption though so I would use seeds. Hi there! I’m thinking macadamia nuts would be the closest. Although, I have tried that and it was a little tricky because they don’t get *quite* as creamy as cashews. You could also try subbing vegan cream cheese? could you use almond yogurt instead? Sure! It will just yield a different flavor and I haven’t found one personally that tastes very good. I used a 7-inch. But anything in that range will work. Hi Marie! The easiest way to subscribe to our mailing list, is by simply adding your email address to the yellow button on our homepage. Hope this helps!